Amazing. I’ve just returned from France fully expecting to have missed all my lovely veggies, but they’re still going strong and I’ve been able to harvest all sorts! Among the more exciting are asparagus peas and okra, neither of which I have grown before. Asparagus peas are, I have to say, particularly pleasing as they are such pretty plants with their red wine coloured flowers. Bring a large pan of water to the boil. Add the potatoes (whole if small enough or halved if they’re too big) and boil until tender. Drain and leave to cool. Once cool, chop into bitesized pieces. As soon as the seeds start to pop, add the coconut oil and onion. Cook the onion for 3-4 minutes and then add the ginger and garlic. Cook the mixture for 1 minute, then add all the other spices and stir. Add the tomatoes and okra, and stir well. 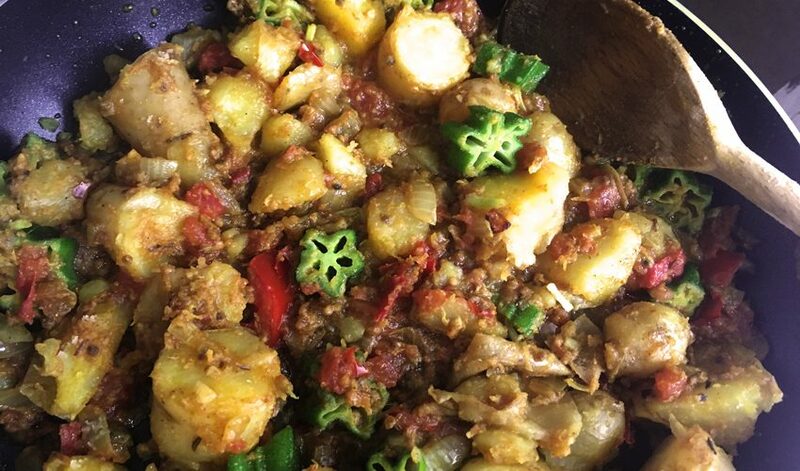 Once the okra is nearly cooked through add the potatoes with a splash of water to loosen the mixture. Lower the heat and cook for 5 mins. Add the Vietnamese coriander and season with sea salt before serving. That’s it – it’s a really simple dish that would work brilliantly either as a dish alongside other curries and dals, or as a side to a cumin and yoghurt flavoured BBQ butterflied lamb. Delicious! ps. If using spinach or chard, just chop the leaves roughly and add them in at the same time as the potatoes at the end.